Exemplary Pantawid Children of the Department of Social and Welfare Development. 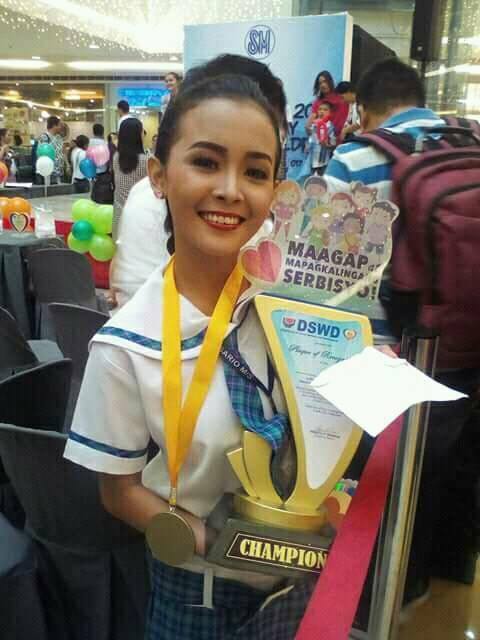 ROXAS City – Fourteen-year-old Jopay Pelayo of this city was declared the regional champion of the 2017 Search for the Exemplary Pantawid Children of the Department of Social Welfare and Development. Pelayo received a trophy and P8,000 cash prize. Pelayo will represent Western Visayas in the national level on November, the Children’s Month. The search was open to all 10- to 14-year-old children whose families were recipient of the government’s Pantawid Pamilyang Pilipino Program, or 4Ps. The runners-up were the 14-year-old Karla Czarina Sulit of Iloilo (1st), Ma. Gabrielle Angeli Nadate, 13, of Guimaras (2nd), Chynna Pajares, 13, of Antique (3rd), Ma.Lyn Mae Balidiong, 13, of Guimaras (4th), and French Marie Chin Cayot, 12, of Bacolod City (5th). They also received trophies and cash prizes. The winners were judged based on their behavior, talent, intelligence, school and community participation, and their appearance in the Kaya Ko Ang Pagbabago program. The search encouraged the participants not only to comply with the 85 percent school attendance but also to become “outstanding citizens,” said pantawid information officer II Montesa Caoyonan. The contest also encouraged the participants to be responsible at home, school, and their communities, Caoyonan added. Last year, Anedaine Geamal of Antique landed in the 4th spot of the national search.